Summer is the time for bright lips right? Oh heck yes it is! 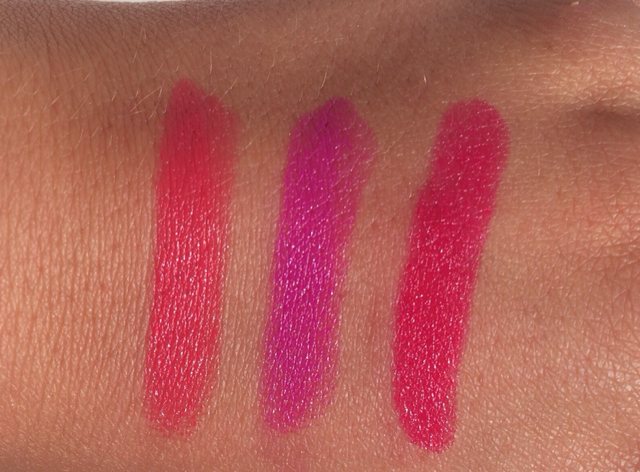 But another important part of summer lip colors is the ease of wear & the lasting power. I don't want to have to constantly reapply a high maintenance lip color if I'm out and about. Maybelline Color Sensational Lip Stick (top left) - These were the first lipsticks I bought when I was getting into makeup! Way to start our subtle right? 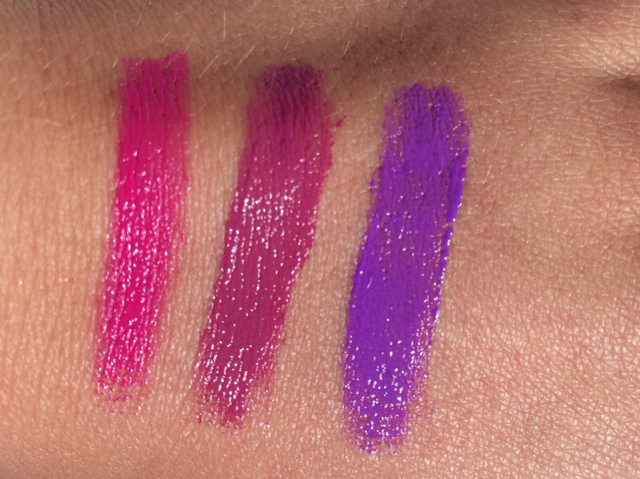 I love these because of the bright colors and amazing pigmentation but also because of the staying power. 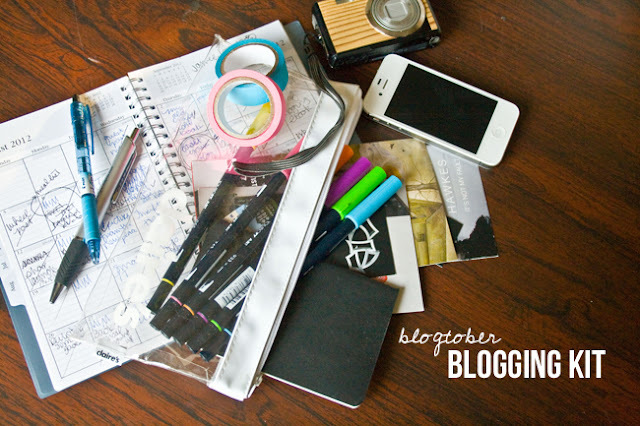 I find that if I apply, blot, then apply another layer I end up with a longer lasting stain on my lips. L'Oreal Colour Caresse Lip Colors (top right) - Now these are my go to in the purse lip products. If your hurry and run to your Big Lots or CVS, you can find these for about half their original price. These lip colors are very moisturizing with a great color pay off. For having a balm like texture they do pack a lot of color. These are great for touch ups and keeping your lips hydrated. Not too fussy if you need a lip color in a pinch as well. Colors from left to right are Blushing Sequin, Pink Cashmere, & Sunset Angora. 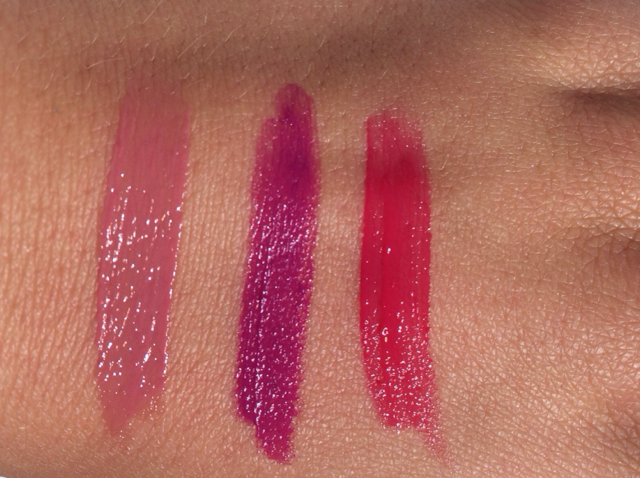 Wet n Wild Fergie Collection Vicious Varnish High Shine Lip Satins (bottomed left) - if you've been thinking about picking up the new Revlon Moisture Stains you might want to consider this cheaper alternative. When I first bought these I didn't quite like them. I'm pretty sure it was because they are a different texture. They stay glossy for a while then they turn to a little bit of shine, then finally there's the stain. Even only having these swatches on my had for a second they left behind a little satin. So they are super worth it for the $2.99 ish price tag! The colors above (left to right in the photo above & bottom to top in the first photo) Flawless, Legendary Face, & Throwing Shade. LA Girl Glazed Lip Paints (bottom right) - These are super new to the drug store and if you're looking for them check out KMart! 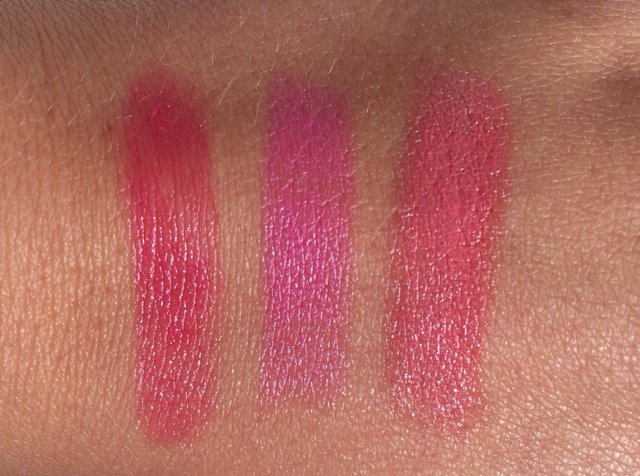 Colors (from left to right above) are Bombshell, Blushing, & Coy. The color of these makes them my fave. While not as easy to apply as the ones above, the glossy finish and the colors really push them to the top for me. I suggest applying them with a lip brush because they are super runny and hard to apply with the squeeze applicator. If you apply a thin enough layer it won't run out of your lipline and it will last pretty well. They don't stain as much as the Wet N Wild stains above but they still stay on pretty well. I think I get about 3-4 hours out of these colors.